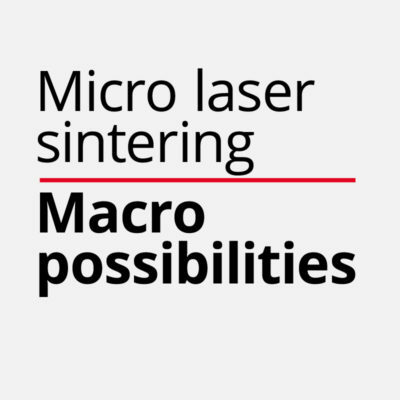 Micro Laser Sintering is a powder bed based additive manufacturing technology, often called Selective Laser Sintering or Selective Laser Melting. Micro Laser Sintering is an industrial technology, providing micro metal parts to several industries. A 3D-CAD model of the target geometry contains all details of the final part. This CAD model is split into several cross sections, called layers. During manufacturing, a thin layer of powder is applied to a build platform. The powder is selectively fused by a laser beam according to each cross section. After that the building platform is lowered, the procedure of powder coating, fusing and platform lowering is repeated layer by layer, until the part completed. Micro Laser Sintering combines the advantages of additive manufacturing and micro machining for the first time. Micro Metal parts of incredible accuracy, detail resolution and surface quality are manufactured this way. These advantages result in the ability to manufacture moveable parts and assemblies in a single step. The basis of these outstanding results is the combination of a very small laser beam spot size, special micro powder and super thin layers. The parts are used in any industry requesting small metal parts of high accuracy, smooth surface finish, outstanding detail resolution and complex shapes. Current main industries are Medical, Semiconductor, Mechanical Engineering, Aerospace, Energy and Chemical as well as Jewelry and watchmaking.